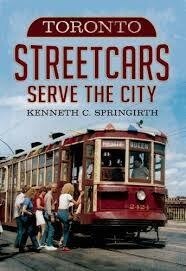 Toronto Streetcars Serve the City - Signed by the Author! Home / Toronto Streetcars Serve the City - Signed by the Author! The Toronto Beaches Lions Club Easter Parade of April 8, 2012 leading off with Toronto Transit Commission historic Presidents' Conference Committee car No. 4500, vintage Peter Witt car No. 2766, and Canadian Light Rail Vehicle No. 4074 in this view on Queen Street at Woodbine Avenue was witnessed by thousands of people. Kenneth Springirth, with a lifelong interest in rail transportation, has made numerous trips to Toronto to ride, research, walk, and photograph the streetcar lines. Born and raised in the United States, he commuted to the Drexel Institute of Technology (now Drexel University) in Philadelphia by streetcar, subway, and sometimes commuter train. His father was a streetcar motorman in Philadelphia and his grandfather was a streetcar motorman in Washington D.C. This book is a photographic essay documenting Toronto's extensive streetcar system that during 2012 on an average Monday to Friday work day carried an average of 285,000 passengers with its 11 routes, 671 stops, and 247 cars. From the urban residential area of Kingston Road to the commercial district of Spadina Avenue where between King and Bloor Streets there is a streetcar in peak periods every 2 to 3 minutes, this book provides an insight to an amazing streetcar system.